for creating, testing and debugging Perl scripts, which runs on Windows 9x/NT/2000/XP or later. 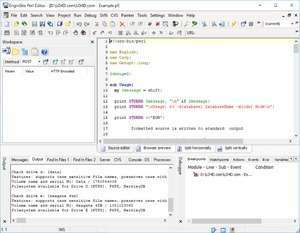 By bringing together the editing, testing and debugging instruments into a single, user-oriented environment, EngInSite Perl Editor makes it easy to develop sophisticated Perl applications right on your desktop. EngInSite Perl Editor Professional 3.8.5.171 is a shareware program and can be used as a demo to try the software until the free trial period has ended. A full version of the program is available after the trial period ends. For security reasons, you should also check out the EngInSite Perl Editor Professional download at LO4D.com which includes virus and malware tests. Additional screenshots of this application download may be available, too.